If you want to make a quality puppet you will need to start with the puppet's head. Here is a craft to show you how to make a papier mache puppet head that turns out amazingly! Find out how with the step by step tutorial below. 2. Strips of paper approximately a half inch wide are now cut from newspapers, magazines, paper towels and other inexpensive papers. 3. Mix the paste to a creamy consistency. 4. Dip the strips of paper into the paste. 5. Pull the strips of paper between your fingers to wipe off any excess paste. 6. Apply these strips directly to the modelled head, making sure that they follow the contour of the form. If necessary, press the paper firmly to the features. 7. The paper should be applied in all directions to insure strength and uniform thickness. Many layers of paper should be applied. At least 5 is suggested. NOTE: To insure yourself that each layer thoroughly covers the previous layer, it is wise to change the color or kind of paper on alternate layers. 8. 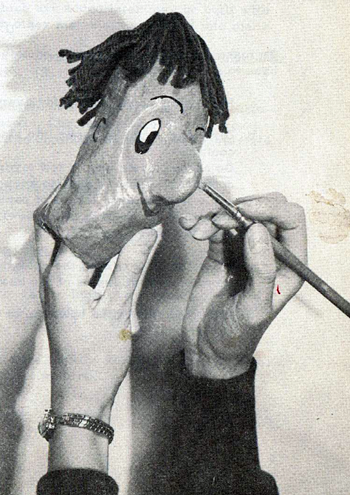 After the papier-mache is thoroughly dry, slice the puppet head in half like a melon and remove the clay. 9. 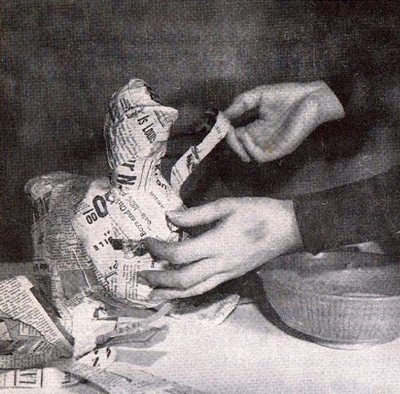 Now fasten the two halves together by applying additional strips of papier-mache. When this is thoroughly dry the head may be smoothed with sandpaper and painted. 10. Bonnets, hair, collars, etc. may be added by gluing yarn, corn-silk, construction paper, etc. to the head. 11. Painted surfaces should be shellaced for permanency.